recess, to probe the alleged mismanagement of N33bn currently rocking the Presidential Intervention Programme for the North-East. Already, the House of Representatives ad-hoc committee, probing the alleged scam, had said Vice President Yemi Osinbajo, in his capacity as the chairman of the programme, and the Director-General of the National Emergency Management Agency, Mr Mustapha Maihaja, were culpable. The Vice-Chairman, Senate Committee on Media and Public Affairs, Senator Ben Murray-Bruce, told The Punch on Friday that the upper legislative chamber would commence the probe as soon as the House of Representatives ad-hoc committee concluded its own investigation. The Senate spokesman spoke just as NEMA stated that the probe by the House into the N5.8bn Presidential intervention funds, approved by the vice president for the North-East, was shocking and should not be directed at NEMA alone. The Chairman of the Reps panel, Mr Ali Isa (APC, Gombe), had told journalists on Tuesday that Osinbajo, as chairman of the programme, issued directives leading to the release of the funds, while the NEMA DG supervised the execution of the directives. The Reps panel also specifically indicted Osinbajo for allegedly approving N5.8bn North-East Intervention Fund, which it claimed was illegal. Osinbajo had dismissed the allegation, stating that the government was obliged to make an emergency response to the humanitarian crisis in the geopolitical zone. The senate spokesman, in a telephone interview with The Punch in Abuja, said the Senate would carry out an independent investigation into the issue considering the weight of the allegations. Murray-Bruce said, “It is very likely that the Senate will institute a probe into the issue but you will get the details on Tuesday. We will allow the Reps committee to finish its probe before we start our own. But a senior official of NEMA, in an interview with The Punch, stated that all necessary documents detailing how the funds NEMA got were spent had been submitted to the lawmakers. The official, who spoke on condition of anonymity, said the procurement process for some of the intervention programmes started from the Federal Ministry of Budget and National Planning and not from NEMA. Asked why NEMA failed to follow due process, as alleged by the lawmakers, the official replied, “Do you believe them? The procurement process did not start from NEMA; it started from the Ministry of Budget and National Planning. All that was given to NEMA was money for the distribution of the relief materials. Aside from that money, no other funds came to NEMA. So, some of the questions should be channelled to that ministry. Reacting to some of the issues of port clearance and transportation of emergency food assistance donated by the Chinese government, NEMA stated that the Federal Government received a total of 6,779 metric tonnes of rice for the IDP in the North-East as donation from China. “This amounted to 271 containers, which arrived at Apapa ports between June and October 2017. The correct total value of the rice is N2.25bn and the amount spent on demurrage and storage was about N450m, not N800m, as alleged by the committee,” it stated. 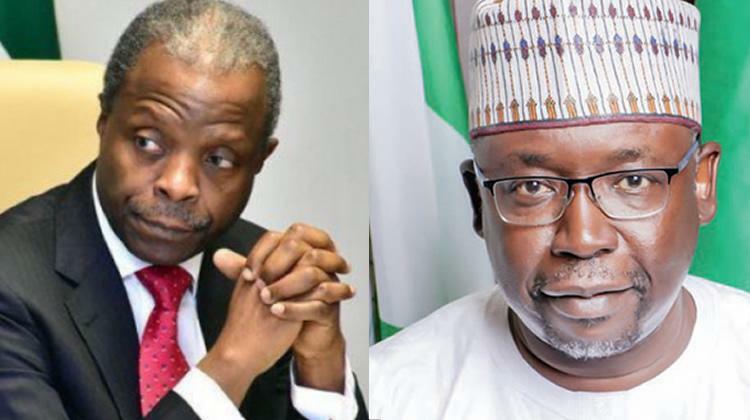 Meanwhile, the Peoples Democratic Party has urged Osinbajo to seek forgiveness over the alleged intervention fund scandal even as it asked the VP to make refund to the government. National Publicity Secretary, PDP, Mr Kola Ologbondiyan, in a statement on Saturday, said the alleged indictment of Osinbajo in the matter by the House of Representatives was sad, given the VP’s perceived transparent and pious posture. He said, “The Peoples Democratic Party says Vice President Yemi Osinbajo, as a preacher, should search his soul, seek forgiveness and make restitution for entangling himself in corruption and sharp practices instead of his lame effort at concealment in the N5.8bn North-East Intervention Fund scandal.